Uranus represents innovations, revolution, new creations, rebellion, and unknown technology. 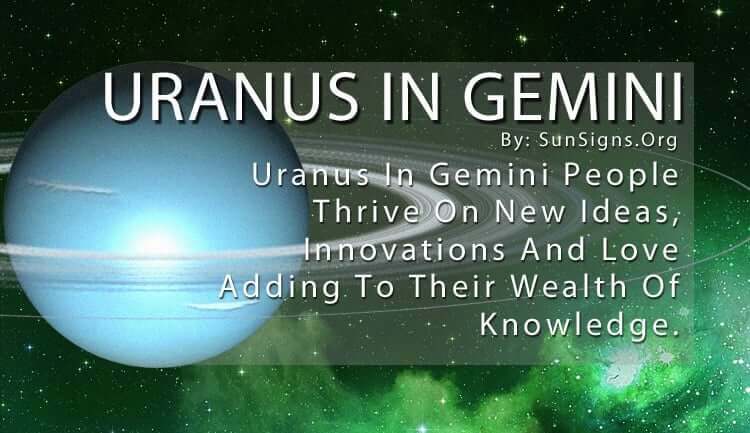 Uranus in Gemini thrives on new ideas and loves adding to their wealth of knowledge, which makes them a very innovative star sign. They are always on-the-go in search of the next big thing, which is how they manage to stay on top in many areas of their life. Uranus in Gemini is also good with communication and they love to share their knowledge with others. This kind of enthusiasm makes them great teachers, but also great scientists, inventors, and explorers. Their thirst for discovery drives them in everything they do, whether it’s for work or for play. They are always looking for ways to improve what they are doing, and because they are so busy they love finding new ways to streamline the process. The most useful trait of the Gemini Uranus sign is their quick understanding of any subject matter. They are able to absorb the pertinent facts and explain them to others in such a way that makes it easy to comprehend. While they don’t focus on all the facts or details, they are able to understand the overall picture in such a way that makes sense to others. This also allows them to keep an open mind, which often makes them leaders in new social ideas and concepts. Uranus in Gemini is a kind of Renaissance person who is good at a lot of different things, but never really masters one thing. They can’t concentrate on a single topic for too long because their curiosity is too great. They have to keep going forward because they just can’t sit still. The only thing that can be frustrating to others is their inability to focus on any one thing. Uranus in Gemini can change directions very quickly and without notice. So those who aren’t prepared for a sudden shift often get left behind through no fault of their own. It’s difficult to predict where Uranus in Gemini will head off to next, for they don’t often know themselves. Their ideas change on a whim, and they don’t always tell people when that happens. The Uranus in Gemini needs to utilize their communication skills to let others know their next move. If they are able to bring others on their creative journey they are guaranteed a better success rate, for friends and colleagues can help to finish the job. They are able to create change through progressive thinking. They can get others who are often stuck in their ways to see things in a different light. They can be seen fighting injustice through protesting and finding innovative ways to get their message out to the masses. And with their large social network, Uranus in Gemini is able to change the world.